Trekking Poles, Don't hit the trails without them! Home Gear & Tech Trekking Poles, Don’t hit the trails without them! Whether you’re looking for more stability or want to relieve soreness in knees or merely burn more calories on your hike, trekking poles provide all these fantastic benefits at a very reasonable cost. What are the uses of hiking poles? How do they help you? Why would you need trekking poles? We’ll dive into the many useful reasons to have a pair of hiking poles and help you discover the best way to fit and use them as well. The core use of a hiking pole is to relieve pressure, provide balance and give you traction. That is the simple premise of trekking poles. When you’re carrying around a heavy pack and have a ton of weight on your shoulders trekking poles, allow you to use your upper body strength to help you carry a pack load, remain balanced and give you stability and traction while staying upright. I’ve found in my middle age that they offer superb support and lower the stress and impact on my knees. This had the immediate benefit of helping during long or multi-day hikes and helping me from feeling any symptom of pain or burnout. Did you know: When using hiking poles, you may burn up to 20% more calories on your hike than without. 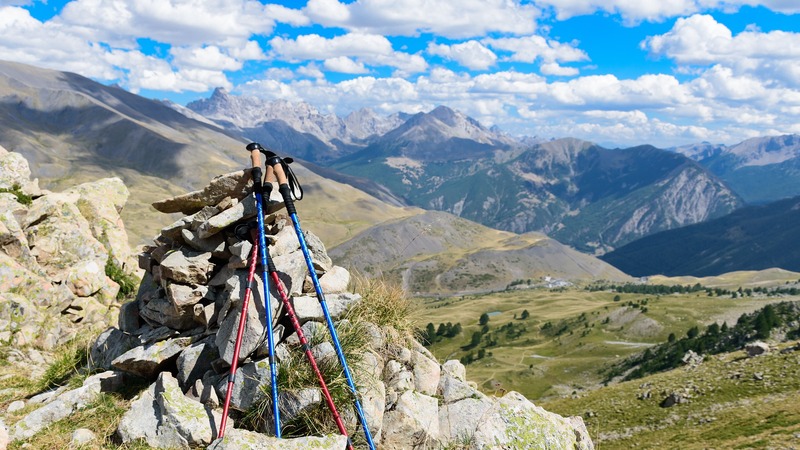 Hiking poles can help you burn calories for those looking to increase their fitness! If you’re planning your food and caloric intake for a long hike make sure to plan for increased burn when using trekking poles. One growing secondary use of hiking poles is to use them as your tent poles. You can reduce the amount of gear you take by using your hiking poles as tent poles and having them serve a bigger purpose on your hikes. Some people even go to extremes as to carry a tarp and hiking poles and not even use a real packages tent. When I started looking for hiking poles, I was somewhat daunted by the sheer amount of choices and prices. I wasn’t looking to spend too much money, but at the same time, I didn’t want junk that could increase my chances of getting hurt. The last thing you want is a flimsy pole that will flex/break under your weight or an adjustable trekking pole that won’t safely stay locked. Solid Trekking poles have no height adjustment and should be purchased with correct fit. Many people enjoy solid core poles because there is a limited potential for failure and durability/strength is very good. With no clamps or tightening mechanism to fail, you can generally rely on solid or nonadjustable trekking poles for a long time. Solid poles resemble skiing poles and are sometimes interchangeable. Adjustable hiking poles have height adjustments to allow you to set the height for each person that uses them or allowing you to make adjustments depending on trail, ascent or descent configurations that you prefer. There are multiple adjustment types available on the market today. I like the telescoping trekking poles because they do adjust for the terrain, but most importantly I can collapse them all the way down to carry on my backpack without them dangling up against my legs. Having fully collapsible and adjustable poles work great on the trail and for storing at home. When using telescoping poles make sure you fully understand and test the mechanical locking mechanism. Improper use of the lock can cause premature failure of your pole and reduce its lifetime. You want to make sure that you’re using these locks tight enough to do their job but not so tight that you’re deforming the material or causing bends and pinches in your poles. Modern technology has certainly caught up in these simple devices. 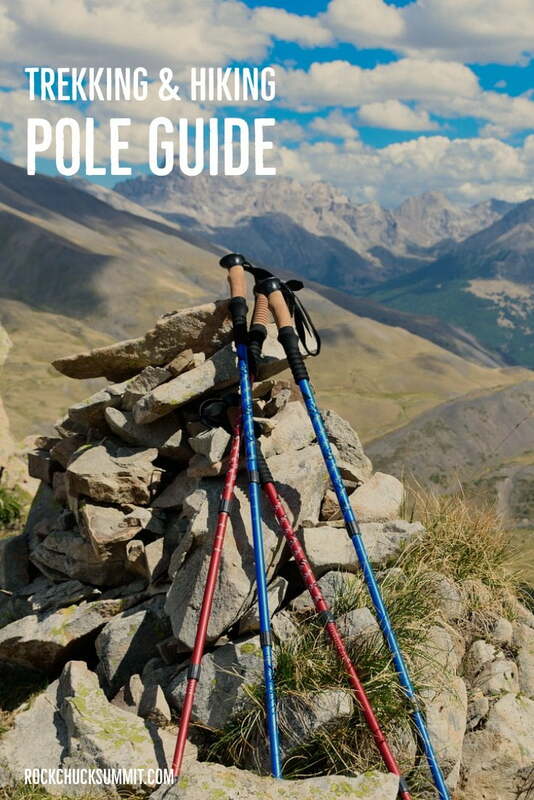 Trekking poles are made of advanced materials such as carbon fiber or more common materials such as aluminum or wood. Carbon fiber trekking poles are the most advanced, lightest and strongest poles on the market. When comparing Carbon fiber to Aluminum, carbon fiber is almost twice the stiffness and has nearly twice the resistance to damage as aluminum. When you know you need the most durable material because of the most treacherous terrain or long distance, then Carbon Fiber trekking poles would be the pole of choice. The best feature of aluminum is that they’re affordable and durable. If you’re looking for the cost-effective option available, then aluminum is your best bet. Aluminum is most popular in the solid or single piece (nontelescoping) trekking poles. Not much need to embellish anything here. Wood offers superb durability, beautiful natural characteristics, and designs as well as being the best “green” option. You can find these in any length or size for any type of hike or trail, and they too work great as tent poles and sticks for just about any reason you would need a stick. 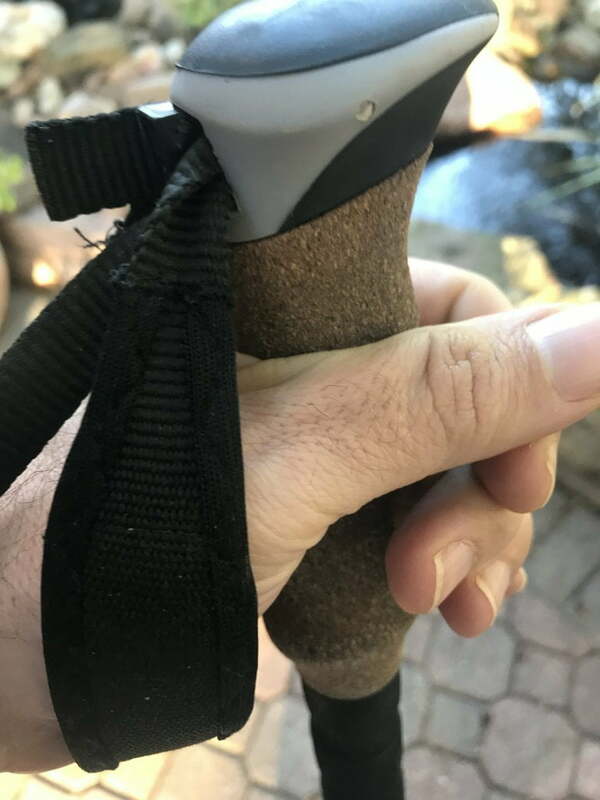 Cork is the most recommended material for hiking pole grips. It is known to be naturally antimicrobial, water resistant and durable. All of these strengths are great for something that will be held tight by sweaty palms and hands. Cork is super lightweight, natural and comfortable to grip as well as anti-slip. All of these features provide a robust grip, and I wouldn’t recommend anything else. Hiking poles can come with many accessories and options to help you in all types of terrain, weather, and conditions. Pavement feet / Rock tips – These are feet that can be optimized for pavement with a curved foot to increase traction and motion on a flat surface. They protect the asphalt/pavement from the tip of your pole and give you more traction. Sand/Snow Cups & baskets – These cups or baskets go right above the foot and provide a broad surface to give you stability on materials where the tip of the hiking pole can sink. Great for hiking on dunes or snowpack, so your pole doesn’t sink in too far. With an understanding of design, materials, and options you have available picking the right hiking pole should be on proper fitment, use, and affordability. The nice thing about telescoping poles is that they’re one size fits all. A solid aluminum or wood pole is excellent in that they’re simple with fewer things that can break or fail. No one pole rules them all so shop within your budget. As with any gear, I highly recommend you find a place where you can try before you buy or use equipment that you know friends and family have used and trusted. When using hiking poles, it’s recommended to adjust the height so that as your hands are on the grips and your elbows make a 90-degree angle while standing still and upright. If your poles are not adjustable, then they should be purchased so that when your hand is in the grip, they too keep your elbows at a 90-degree angle. Outside of height adjustment, it’s essential that you understand how the pole grip and hand band work. With good quality poles and straps, you shouldn’t have to have a “Death grip” on your gear to be able to use them as leverage. When you put your hand through the strap and tighten the loop correctly, you should be able to swing the poles at your side forward/backward and feel that you can stick them in the ground and get leverage on the straps. While on the trail, you want to make sure that your trekking poles are adjusted for your body height to keep that 90-degree angle. This angle keeps your form/posture at its best and provides the best transfer of energy/strength to your poles when you need them. For the most part, you should find yourself just walking in a stride while hiking on flat surfaces. The poles will fade away from your conscious and be a part of your rhythm. When hiking uphill with hiking poles, you will typically place them in a shorter distance ahead of your feet so you can use the leverage and stability to go uphill. 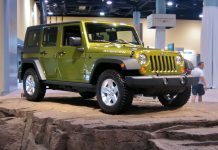 Make sure that the strap securely braces your hands; you should be able to “lean in” on the strap a bit and use your poles for stability and leverage to “Drive up” a trail as if you have four-wheel drive. When descending its common to extend your poles a little bit so that you can reach them out further ahead of you to provide further stability and brace – often lightening the descent load on your knees. If its downhill grade of dirt and small rocks, I’ll extend a bit. If its more manicured stairs or boulder/rocks, I’ll usually leave them the same height since I’m often balancing across different objects and I don’t want any reason for my balance to be too far aft. Experiment around and find your comfy spot! 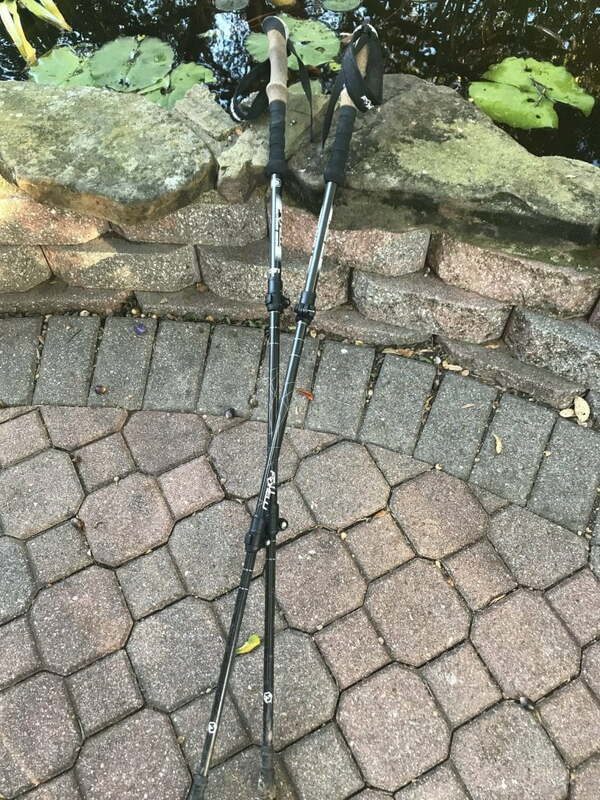 After much research, I chose Foxelli Trekking Poles – Foxelli Trekking poles have a ton of reviews, they’re affordable, come with lots of parts, and they are durable. I’ve got over two years of use with mine, and they’re still holding up! I’ve used them so far to Summit my first 14ker – Quandary Peak, Climb up Great Sand Dunes National Monument and put on hundreds of miles on one of my favorite local hikes here in Austin. Foxelli trekking poles have been a fantastic value and proven to be quality gear that I take with me on every adventure. I’ve been very happy with my purchase and highly recommend them if you’re looking for an affordable set of hiking poles. Question: Are trekking poles worth it? Answer: Yes! They are multi-purpose tools that afford you stability, traction, and utility while on the trail. 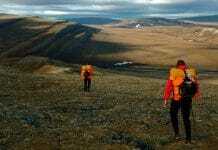 Question: What is the difference between trekking and hiking? Answer: Nothing. Just different words for describing going out on your own two feet. Some people will have ideological associations, but as far as the gear goes, they’re the same. Question: Are trekking poles essential for a long hike? Answer: For me they are. Others don’t like the added weight of using or carrying them around. Try them out yourself. 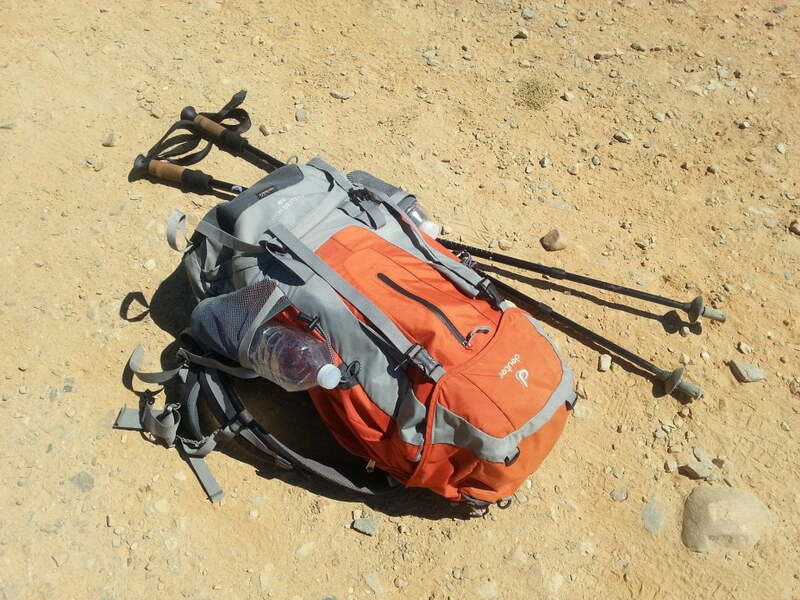 I find their support and utility to be one of the most valuable pieces of gear I have on the trail. Pin this image on Pinterest to save this article for later or to share it with your friends and family! What kind of hiking poles do you use? Are you still shopping around? Do you have any further questions we could answer? We’d love your feedback on what you liked, didn’t like or whether or not you enjoy using poles on your hikes at all. Please leave a comment below! Previous articleHiking Mexico’s Snow-Capped Volcano, Nevado de Toluca – 15er!